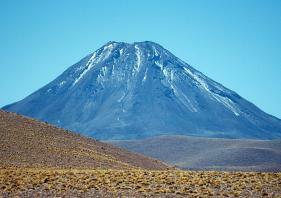 summit crater in northern Chile, with an edifice height of 1.300 m.
a chain of old volcanoes, Cordon Puntas Negras - Chalviri. with additions made by us. to high levels, often resulting in explosive eruptions. They are typically made up of about half lava and half loose or fragmented rock ejected from the volcano, and are therefore also commonly known as composite volcanoes. Mount Saint Helens in Washington and Mount Pinatubo in the Philippines are examples of stratovolcanoes. Chiliques are also present. These older flows are more extensive than those from the present volcano and extend for up to 10 km from the present summit. 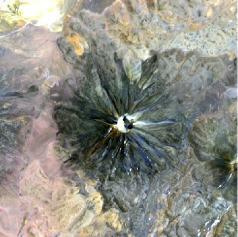 Aguas Calientes (A), Laguna Escondida (E), Chinchilla(C) and a small craterlake-like vent (M). This volcanic area is located from 23º37'S; 67º40'W to 23º41'S; 67º34'W. 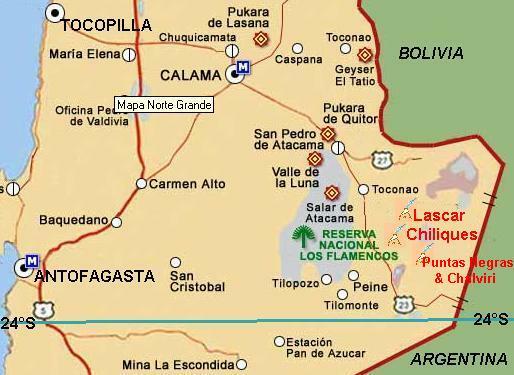 extending15 km southwards from Volcan Puntas Negras to Cerro Tuyajto (T). about 500 km2. 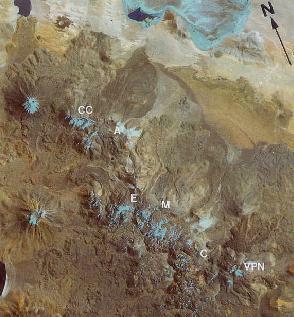 Although this complex broadly resembles the smaller Escalante-Sairecabur complex (q.v), Cordon Puntas Negras is the result of a several different styles of activity which have produced constructs of differing character. of many of the individual flows, or to relate them to a particular cone. features. The dominant style of activity appears to have been the eruption of andesitic lavas.